1/10 CT. T.W. 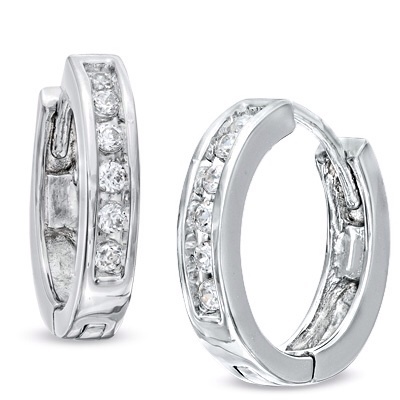 Diamond Huggie Hoop Earrings in 10K White Gold Hoop earrings are a classy and versatile choice of beauty for a sophisticated woman. With a touch of brilliance the simplicity of a hoop earring becomes magnificent. Prong-set between shining 10K white gold, round diamonds shimmer along these hinged back huggie hoop earrings. Surprise her with a gift she'll love, the gift of diamonds. This item is only available online. PRODUCT SPECIFICATIONS Stone Type	Diamond Stone Shape	Round Diamond Total Weight (CT. T.W.) 1/10 Stone Setting	4-Prong Gold Karat	10K Back Type	Hinged Metal Color	White Metal Type	Gold Stone Color	White Diamond carat weights (CT.) represent the approximate total weight (T.W.) 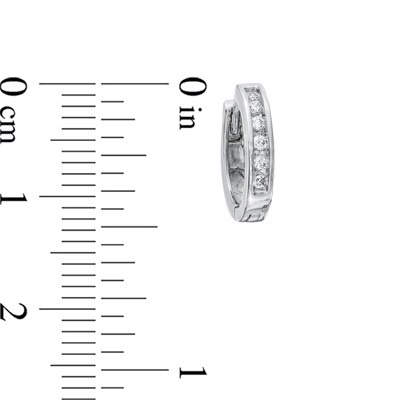 of all diamonds in each setting and may vary no more than .07 below the stated weight. Typographic errors are subject to correction. Merchandise enlarged to show detail and may not always be exactly as pictured. Promotions, prices, styles and availability may vary by store and online.